Pacific Gas and Electric Co. and its parent company on Tuesday filed for Chapter 11 bankruptcy protection, a move the company insists is necessary to contend with tens of billions of dollars in potential liabilities growing out of the calamitous wildfire seasons of 2017 and 2018. In a simple voluntary petition filed just after midnight Tuesday morning with the U.S. Bankruptcy Court for the Northern District of California in San Francisco, PG&E estimated its liabilities at about $51 billion and its assets at more than $71 billion. 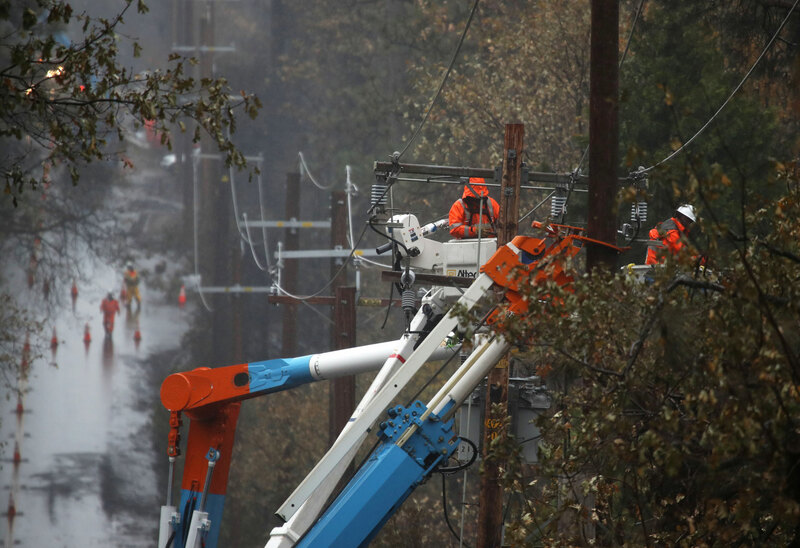 Despite that solvency, PG&E officials argued that they need the Chapter 11 protection because they are unable to borrow enough cash to cover operating costs. As part of the filing, PG&E is asking the court to approve $5.5 billion in financing from nine major banks that will allow the company to keep paying its bills. Judge Dennis Montali, who was assigned the case and oversaw PG&E's previous bankruptcy proceedings 18 years ago, refused to authorize that emergency financing until Thursday. Instead, at a 90-minute hearing packed with dozens of PG&E lawyers and attorneys representing a wide range of other interested parties, Montali mostly dealt with scheduling future court dates. He did, however, temporarily approve two motions thatPG&E argued were central to keeping the business operating: one that will let them use existing bank accounts, and another to allow them continued access to gas and electric markets. "We haven't even had 14 hours to absorb what was filed," Montali said, joking at one point that "some of us try to sleep." And in a somewhat unusual statement for a bankruptcy judge, Montali also pledged to let the public weigh in on the case, even if they are not parties to the bankruptcy proceedings. “I feel very strongly that the public ... should be given their day in court and I will not deny it — but I have to deny it today," he said, adding that the public comments won't "have to be in response to a specific motion." "It will be an opportunity to get things off their chest," he added. "I can't solve all their problems, but I can at least listen to them." 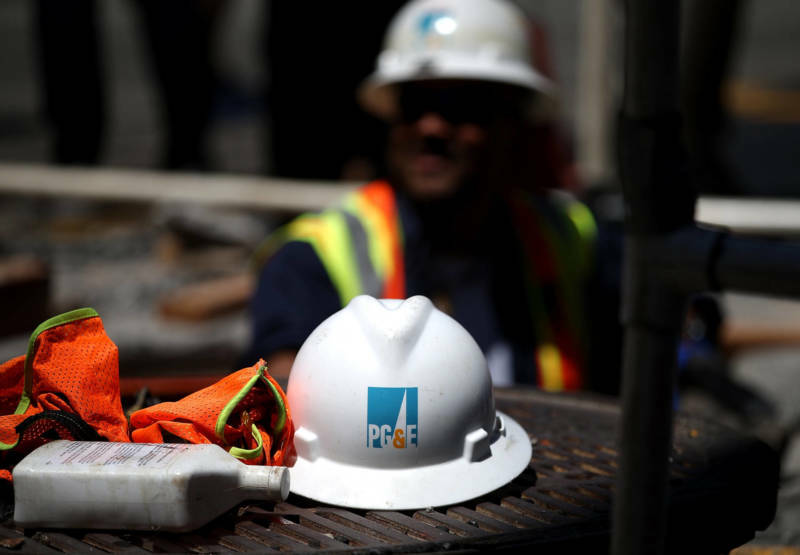 Before the hearing, PG&E filed more than two dozen other motions and documents with the bankruptcy court, including one asking the court to let it keep paying its employees’ wages and benefits for the next 30 days. The company estimates that it will need $61 million for wages and $72 million for benefit payments over the next month. It also requested $130 million to be paid out to about 14,000 employees in special bonuses for fiscal year 2018. The bonuses are intended to reward managers who prioritize safety, help customers, among other things. The average bonus was $13,000. The company is also asking the court to reject a ruling by federal energy regulators that would force them to keep paying renewable energy suppliers the same rates negotiated before the bankruptcy filing. Montali said all of those motions will be considered at Thursday's hearing. PG&E is pledging to not just keep the lights on but is also asking the court to allow it to continue customer programs that help promote clean energy and support low-income customers. In a written statement, interim PG&E CEO John Simon said the company will continue to focus on wildfire safety, adding that leaders there have "heard the calls for change" and are committed to emerging from bankruptcy with an "energy system our customers want and deserve." "Throughout this process, we are fully committed to enhancing our wildfire safety efforts, as well as helping restoration and rebuilding efforts across the communities impacted by the devastating Northern California wildfires," Simon said. "We also intend to work together with our customers, employees and other stakeholders to create a more sustainable foundation for the delivery of safe, reliable and affordable service in the years ahead." When it announced its intention on Jan. 14 to file for bankruptcy protection, the state's biggest utility said two years of horrendously costly wildfires had created such a massive potential debt that it needed a bankruptcy court to help restructure the company for its future viability. The bulk of that feared debt could come in the form of damage awards and settlements with the 6,000-plus plaintiffs who have filed suit against the company so far after the two seasons of fires. PG&E's view remained unchanged despite last week's finding that the company's equipment was not responsible for the Tubbs Fire — the October 2017 blaze that killed 22 people and destroyed about 5,000 homes in Sonoma County. In its statement following the bankruptcy announcement, PG&E noted that it had long believed it was not responsible for the Tubbs Fire and said that the decision to file for Chapter 11 reorganization was reached with the assumption that the utility would not be held liable for that blaze. The company was also unmoved by demands from one investor, BlueMountain Capital Management, that it shelve the bankruptcy filing. BlueMountain has promised to try to replace PG&E's board of directors at the company's annual shareholder meeting in May. Executives at at the firm, which is one of PG&E’s largest shareholders, reacted angrily to the filing. In a written statement, Blue Mountain officials said they will continue to push for new leadership and would propose a "new slate" of directors by Feb. 21. “Today’s filing is the latest example of how the (PG&E) board continues to fail the company, wildfire victims, customers, employees, creditors, shareholders and the people of California. We urge all stakeholders to support change at PG&E," Blue Mountain officials said in a written statement. The company is one of 53,878 shareholders that stand to lose out because of the bankruptcy filing. State Sen. Bill Dodd (D-Napa), who took the lead last year in negotiating a state response to wildfires, agreed with Blue Mountain executives that the company needs new leadership. “Given its track record of obfuscation and mismanagement, I’m not surprised PG&E claims it can no longer meet its financial obligations,” Dodd said in a written statement. PG&E stock plummeted after a series of 2017 wildfires that swept through Napa, Sonoma and Mendocino counties, as well as Lake, Butte, Solano and Yuba counties. The utility had been warning for a year that it could face bankruptcy if the state didn’t give it some relief. Lawmakers did agree to soften the blow of those 2017 fires by creating a process for the utility to issue ratepayer-backed bonds to pay for costs related to the fires. Less than two months after Gov. Jerry Brown signed that bill, SB 901, the Camp Fire broke out in Butte County on Nov. 8. In less than a day, that blaze became the deadliest and most destructive in state history, killing 86 people and destroying nearly 14,000 homes. Then, in early January, the company’s bond rating was slashed to junk status, making it prohibitively expensive for PG&E to borrow capital. A week later, the company announced in a U.S. Securities and Exchange Commission filing that it intended to file for bankruptcy as early as Jan. 29. Assemblyman Chris Holden, who chairs the Assembly's utility committee, said early Tuesday that he had hoped to see PG&E avoid bankruptcy but is well aware that the future of the company is now in the hands of a bankruptcy court. "Our goal all along was to protect the most vulnerable, but now the bankruptcy court will be managing the future of PG&E and its creditors, including the damages of fire victims for which the utility is deemed responsible," Holden said. He pledged to keep working with lawmakers and the governor to protect victims, provide safe and affordable power for ratepayers and maintain the state's aggressive renewable energy goals. "We will help to provide direction to the Public Utilities Commission, who will be representing Californian’s interests in the bankruptcy proceeding," he said. But it's not clear how much power lawmakers or regulators will have to do those things. While service to the 16 million people in PG&E's territory will not be interrupted, the filing raises huge questions — for ratepayers who could end up paying more, for the wildfire victims who have sued the utility and for the company’s creditors and shareholders. Even before the bankruptcy filing by the utility and parent company Pacific Gas and Electric Corp., PG&E started skipping some payments to fire victims who reached settlements with the company in a 2015 Butte County blaze. Dodd argued that victims should not have to stay in line behind creditors — as will likely happen in a bankruptcy court. State Sen. Jerry Hill (D-San Mateo), who represents victims from the deadly San Bruno blast that PG&E gas equipment caused in 2010, said that the CPUC needs to ensure that the PG&E reorganization benefits consumers. "I believe the Legislature, and [with] our new governor's help and assistance and direction, that the PUC could come back with some strong requirements on that reorganization that puts the balance of power more in the hands of the ratepayers, more in the hands of the consumer and the victims, rather than in the pockets of PG&E shareholders," Hill said.